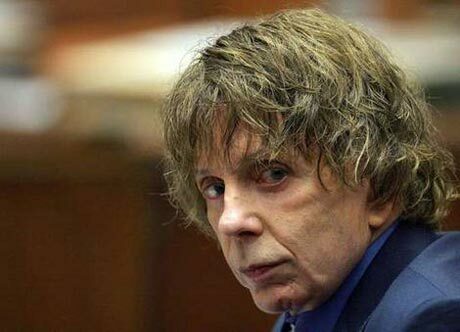 After an epic legal battle, famed "Wall of Sound" producer Phil Spector was given a sentence of 19 years to life in prison today for the murder of actress Lana Clarkson in 2003. Under the sentence, the 69-year-old must spend a minimum of 19 years behind bars before being eligible for parole. If Spector is not eventually granted parole, he will spend the remainder of his days in prison. Spector, who worked with such groups as the Ronettes, the Beatles and Leonard Cohen, was convicted in April of second-degree murder by a Los Angeles jury after a second trial. Clarkson, 40, died of a gun shot wound to the mouth, fired from Spector's gun in his home near Los Angeles on February 3, 2003. The two had met two hours earlier at a Hollywood nightclub. During the course of the second trial, the jury spent almost nine days deliberating the case, in which prosecutors portrayed Spector as "a bully" and misogynist who had a history of "playing Russian roulette with the lives of women" while drunk, the Guardian reports. Clarkson's family has also filed a wrongful death civil suit against Spector, which has yet to be heard by the courts.